Diageo Ireland has launched “Pool”, a Budweiser TV ad featuring a giant game of pool played on the rooftop of the One Wilshire building in Los Angeles. 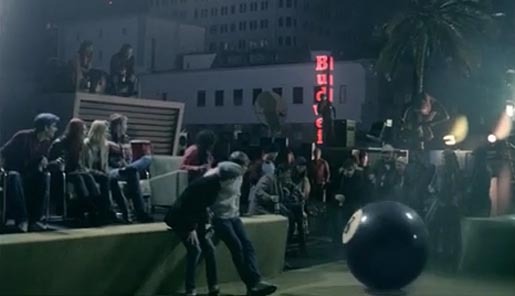 Party goers use specially commissioned oversized props, including a 40ft pool cue, 16 pool balls over a metre high and a giant blue chalk, to send the eight ball to its pocket and out into the street. The Pool advert was developed at DDB London by creative directors Richard Denney and Dave Henderson, agency producer Richard Chambers. Filming was shot by director Chris Palmer via Gorgeous Enterprises with producer Rupert Saunders and director of photography Joost van Gelder. Music is “Brakes On” by French duo Air﻿﻿.